Web development field has evolved a lot in last decade. NodeJS became widely popular among web development community. It is a popular open source platform used for development of web and network-centric applications. In a previous article NodeJS with MySQL was explained. This nodejs MongoDB tutorial explores how to select, insert, update and delete records from MongoDB database. MongoDB is a popular No-SQL document-based database. It is known for scalability and performance. There are no tables or relations in MongoDB as in relational databases like MySQL. To install mongoDB community edition on Windows, Mac or Linux systems, please visit MongoDB download page, and download appropriate MongoDB installer. It is an easy wizard-based process on windows. On mac you can unzip and rename the folder to mongodb. Detailed installation instructions can be found on mongodb installation page . To run mongoDB first time, we first create data directory because mongod process will write to the data directory. Create a directory using command mkdir -p /data/db. On command line open mongdb directory. Then go into bin directory. If system path variable is set, type mongod or ./mongod otherwise type mongod –dbpath /path/to/data/directory. Open another command prompt window to access interactive mongo shell. If you have set system path already, then type mongo or ./bin/mongo. By default mongdb will connect to local host on port 27017. It shows a startup message with mongdb version. To show all the databases, type command show dbs. use command is used to access or create onlinestore database. If database does not exits, a new database is created. To display current database name type > db. > show tables or > show collections command lists collections in a database. In onlinestore database, we need to create a products collection. Data can be inserted into a collection using insert or save methods. If you are inserting data into a collection that does not exit it is automatically created. You can specify any number of columns of different data types in a collection. In order to drop a collection we can use drop method. MongoDB supports string, integer, boolean, double, array, object, timestamp, null, objectID and other data types. You can insert array of documents in to a mongdb collection as follows. If _id field value is not provided mongodb creates a hexadecimal field for _id field that is used as a primary key. Every document in a mongodb collection requires an _id field. It is an auto generated 12 bytes field consisting of 4 bytes for seconds from UNIX timestamp, 3 bytes of machine identifier, 2 bytes of process id and 3 bytes for a counter. save() method can be used to insert or update documents. If _id parameter is specified update of document is performed otherwise insert of document occurs. In order to fetch records from a collection find() method is used. If no parameter is specified it selects all the records in a collection. pretty method displays results in a formatted way. To download and install NodeJS visit nodejs download page. Download and run installer. After installation completes, open command prompt and type node -v. Current installed version of NodeJS is displayed. Next you are going to install express generator. After installation go to the directory where you want to create application. Like on windows type cd c:\ and then type following command. 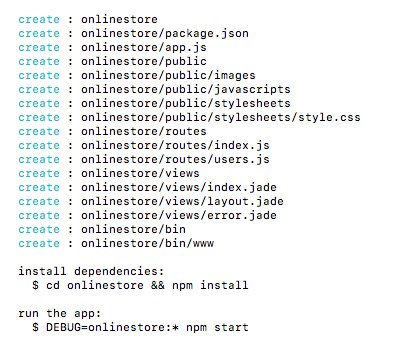 As shown in the image, type cd onlinestore and then enter $ npm install command, It will install all dependencies and packages inside node_modules folder, These dependencies or packages are defined in package.json file. Open project folder in your favorite IDE. Generated application structure can be seen. 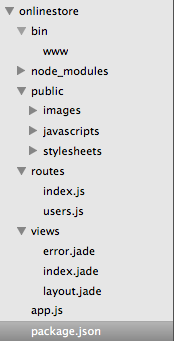 Now inside routes folder open index.js file. Delete all existing code. In order to fetch records from mongoDB database find() method is used. The code above requires express, mongodb modules. We are going to use MongoClient to connect and access database on localhost via port 27017. First we define / route in index.js. Secondly inside router connect to database server using MongoClient.connect method. Local database URL passed to method. 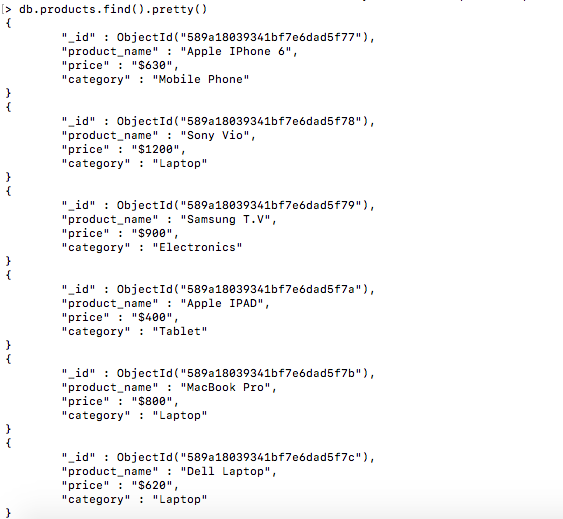 To fetch data from products collection, collection name is passed to db.collection method. find method queries the collection and retrieves cursor for the result set. To use the cursor results it is converted into an array by using .toArray() function. View file index.jade page is rendered using response object render method. Returned data is also passed to the view file. In the image below _id, product name, price and category values are displayed. To display records in Jade view file open views folder and add the code below into index.js file. extend layout line tells that this document is extending the layout.js. In content block a form is created to add or edit records. HTML table displays headers for product name, price , category and action field. If there are data rows returned from server and each loop is executed and displays the values for the document in table cells. Under action field edit and delete links are displayed. A class .editlink and a data attribute data-id is added to edit link so it can be used when edit link’s click event is fired. Clicking on Delete link a confirmation message is displayed if user clicks ok button request is posted to delete route and document is removed from database. To insert records into a mongoDB collection using NodeJS first a route add is added in index.js file. Inside route connect to MongoDB database, In case of success db object is returned else an error is thrown. We pass products collection to db.collection method. To update records in a MongoDB database using NodeJS, user clicks on Edit link an AJAX request is sent to server with id of record. Server returns the existing values of the document to the client and is displayed in HTML form, button value changes from Add Records to Edit Records. In the code below the first jQuery is included from jQuery CDN. Inside jQuery load function a click event handler created for the edit class that is applied to each edit link in records. When any of edit link is clicked this event handler is called. A data-id attribute is defined with _id value that is the primary key of each document. AJAX request is sent to fetchdata page with id field. On successful completion of request data is returned to .done function. Inside .done function values of product_name, price, category and id are assigned to form fields. _id field value is assigned to a hidden field value so it can be posted to the server with other data. Create a route fetchdata in index.js file. This route gets id parameter from client request and connects to mong0DB database. It connections is not successful an error is thrown. db.collections is passed products collection. Inside find method document id is passed as criteria. On success data is sent back to client. After data is received and displayed in form User makes changes to record and clicks Edit Product button. Form is posted to Edit page. In Collection’s update method first a criteria is passed that is _id of the document to be updated. Then updated document and a callback function is passed. Inside callback function result and error is returned. An error is thrown in case of error otherwise user is redirected to ‘/’ route. Create a route /delete in index.js file. Callback function accepts a request, response and next parameters. Inside callback function connection to mongodb database is created using mogoClient.connect. products collection is passed to db.collection method. In callback function deleteOne method is called with id parameter as mongodb objectID. If document is successfully deleted then user is redirected to ‘/ ‘ route to view records otherwise an error is thrown.